Wow! Are those rays of glory coming out of my browser window? Yes! Yes they are! 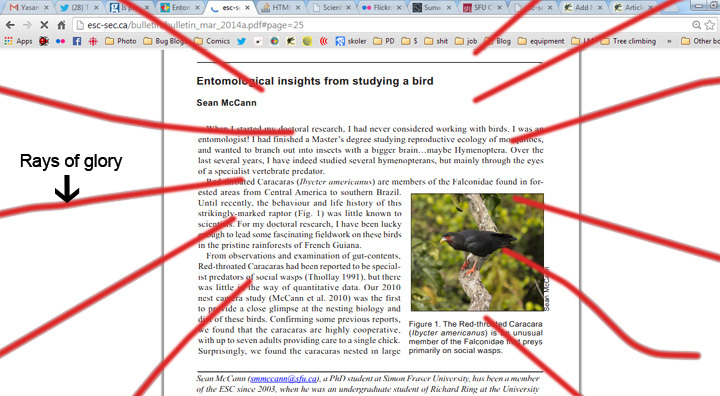 It all happened when I loaded up my latest article on Red-throated Caracara biology! It was published in the March edition of the Bulletin of the Entomological Society of Canada, and gives an exciting entomological overview of my research with these loud and amazing birds. So head on over and check it out, and while you are there, check out the rest of the awesome entomological content as well. This entry was posted on March 24, 2014, in Red-throated Caracara Research. Bookmark the permalink.